Let’s face it. If you’re on vacation in Vegas the odds are pretty good that you’re going to wake up with a hangover at least once. We all know a big hearty meal filled with comfort food is one of the best ways to ease the pain. We’ve got tons of restaurants in town that serve just what you need to cure that hangover so you can get back out there and party all over again. Here are a few of our favorites. You can’t go wrong with a menu item called the Hangover Slopper if you want to ease your aching head. 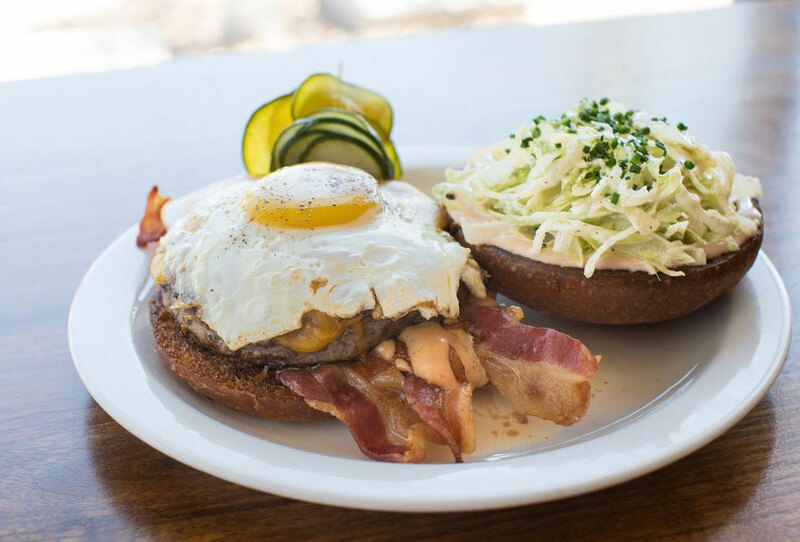 The Slopper is a certified Angus burger on butter toasted brioche bun, smothered with pork green chili, topped with queso fresco, pico de gallo, cheddar and jack cheese and two fried eggs. In case that’s not enough, it’s served with shoestring garlic fries or sweet potato fries. Serendipity combines all kinds of goodness in the Hangover Omelet. It’s filled with bacon, french fries, mushrooms, cheddar and jack cheese and served with breakfast potatoes. You’ll also find other hangover helpers at the restaurant like Wagyu eggs Benedict, corned beef hash and eggs, and peanut butter and banana waffles. Sometimes a really big meal is what you need to recover from indulging the night before. 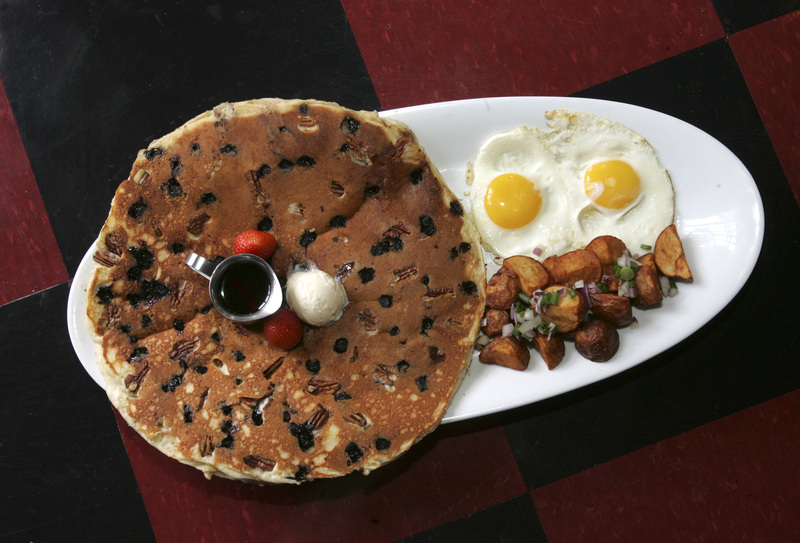 Hash House A Go Go is known for its hearty portions so that’s why we like eating there when we’re having a rough morning. Try the Tractor Driver combo – two eggs with bacon sausage or potatoes with a signature flapjack. You can make it a waffle or French toast for an extra dollar. Or go for one of their hashes like the Famous Meatloaf Hash with roasted red peppers, fresh spinach and smoke mozzarella tossed with crispy potatoes and topped with two eggs. It’s served with fruit and a biscuit. The Irish know how to throw back a pint or two and they also know how to start things out right the next morning. Head to this authentic Irish pub for a traditional full Irish breakfast. You’ll get two eggs, Irish sausages and rashers, black and white pudding, grilled tomato, mushrooms and toast. You can also add baked beans. Peppermill on the Strip, 2985 S. Las Vegas Blvd. People have been nursing their hangovers at this 24-hour restaurant since 1972. The Peppermill serves hearty oversized portions and Bloody Marys made from scratch. 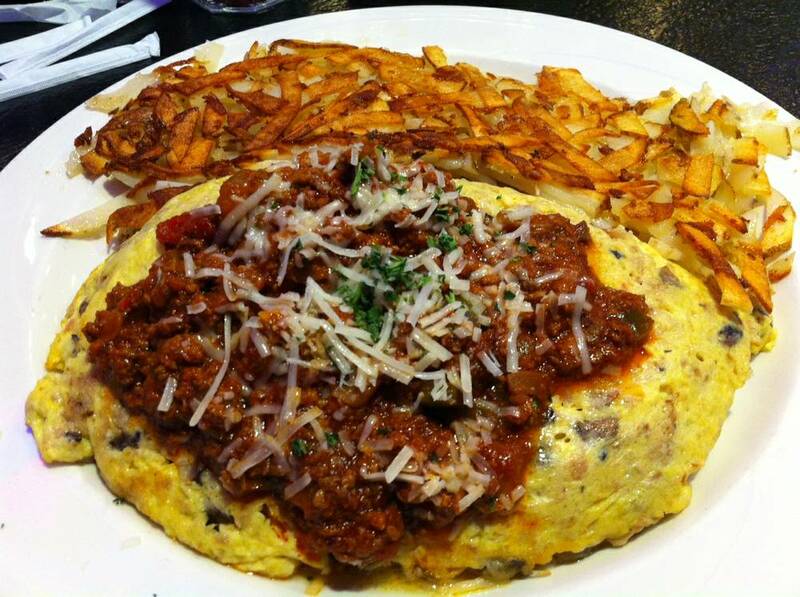 Try one of the huge omelets like the Maserati with sausage, jack and cheddar cheese and mushrooms, smothered in Italian meat sauce and topped with Parmesan. We also like the French Toast Ambrosia – French toast with cinnamon and vanilla, chunks of fresh fruit, a choice of whipped topping or sour cream, served with blueberry syrup. Citizens Kitchen is here to help you. They have a special Hangover Brunch on Saturday and Sunday served until 4 p.m. You’ll feel better after eating things like eggs Benedict, chicken & waffles, corned beef hash, chicken chilaquiles with pulled chicken, eggs, tortilla and enchilada sauce, and a breakfast burrito with three eggs, bacon, sausage, breakfast potatoes and enchilada sauce. If you feel like the walking dead after a night out, have the R.I.P. Sandwich the next day and you’ll feel as good as new. 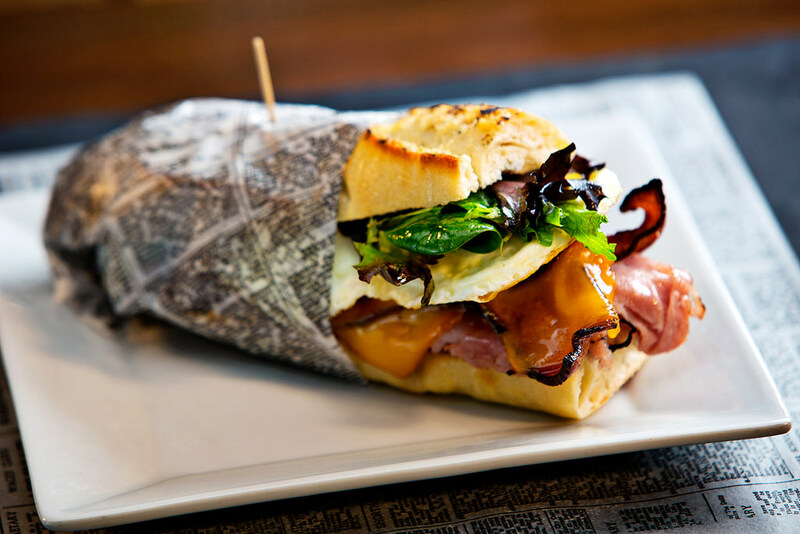 It’s a fresh baguette filled with fried egg, hickory bacon, smoked ham, cheddar cheese and arugula, drizzled with lemon thyme dressing. Pair it with one of Off the Strip’s Bloody Marys or a Bloody Maria with Hornitos Blanco, Sangrita and lime juice. Guy Fieri likes things to be a bit over the top and when it comes to his food, there’s no exception. You’ll find massive portions of comfort food with a twist at his restaurant. 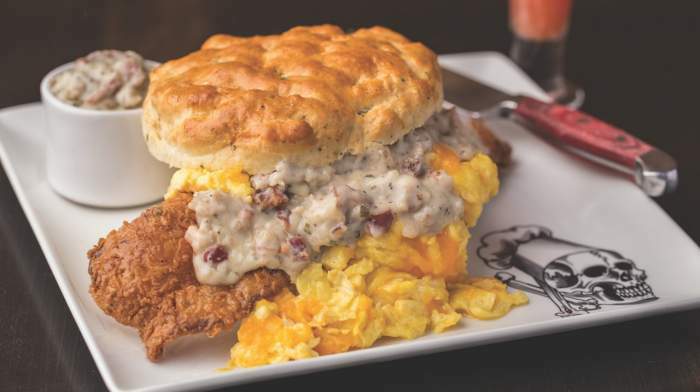 Try the chicken fried biscuits and gravy – a giant buttermilk sage biscuit with crispy chicken fried bacon, scrambled eggs and black pepper breakfast sausage gravy. Fieri also knows how to do Bloody Marys right. There’s a special Hangover Recovery Bloody Mary menu. First, choose your poison – vodka, gin or tequila. Then, choose your garnish. You can pick two things like candied bacon, chicken apple sausage, pickled veggies or spicy olives. Finally, choose your fire and they’ll make it as spicy as you want. MTO Café, 500 S. Main St. This downtown restaurant always serves fresh comfort food. In the mornings you’ll find great hangover busters like the MTO Breakfast – three eggs, chicken sausage, turkey bacon, spam, choice of wheat, Wonder Bread, rye or sourdough bread and mash browns. They’ve also got one of the best creations we’ve heard of – Bacon Dippers. They’re pancakes with bacon cooked right in them and served with peppercorn maple syrup. If it’s more like lunch time before you’re awake, go for the Hangover Burger with bacon, fried egg, cheddar cheese, special sauce and fries. Sometimes a little south-of-the-border spice is what you need for your hangover. Border Grill serves brunch with Mexican flair and a poolside patio overlooking Mandalay Beach or at The Forum Shops at Caesars. 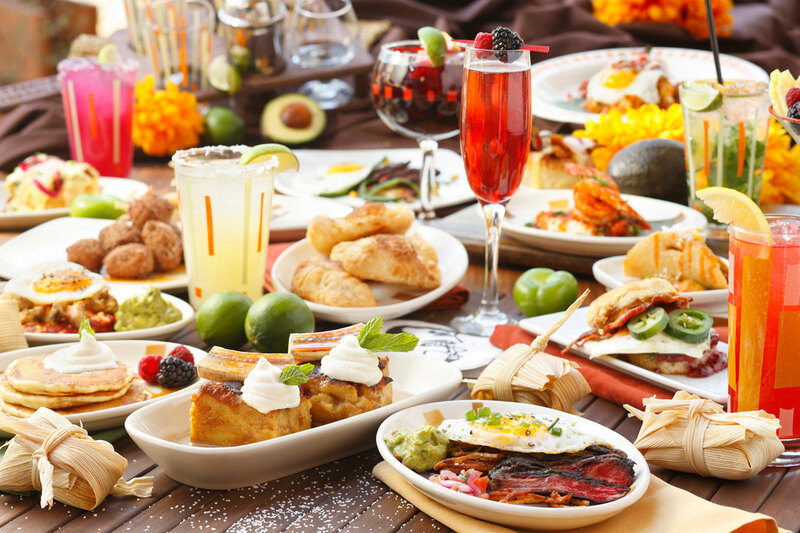 The Border Brunch, served Saturday and Sunday from 10 a.m. – 3 p.m., is $34.99 for unlimited small plates. You can add $10 bottomless mimosas as well, which we highly recommend. The dishes include tomatillo eggs Benedict, chile relleno, serrano ham waffle, churro tots, chilaquiles, biscuit and chorizo gravy, spicy chicken tamales, pigs in a blanket and much more. If your goal is to eat your way out of your hangover, this is the place to do it. The Bacchanal Buffet offers hundreds of items. We recommend the weekend champagne brunch (Saturday and Sunday from 8 a.m. – 3 p.m.). 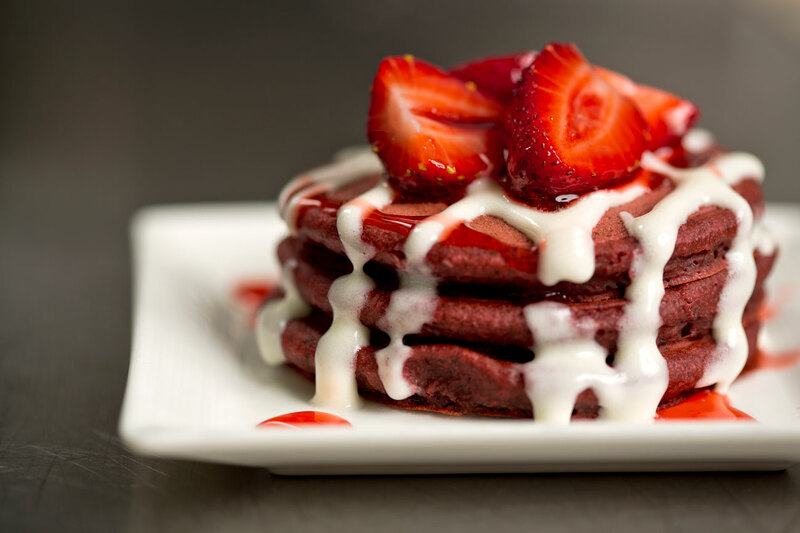 You’ll find breakfast favorites like chicken and waffles, red velvet pancakes, lobster benedict, bagels, fresh juice, pastries, eggs, ham, sausage, potatoes, bacon, hash browns, waffles and much more. You’ll also find lunch items like tacos, pizza, antipasto, Asian dishes, soups and miles of desserts. 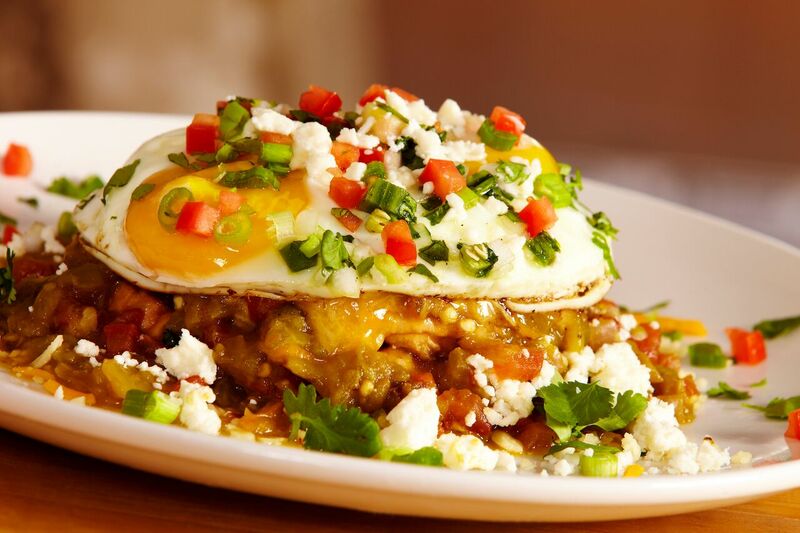 Check out even more Vegas hangover brunch favorites.